While all art is unique, the challenges artists face are shared regardless of background, experience, or artistic medium. With decades of experience in training and helping artists, the expert staff of the New York Foundation for the Arts (NYFA) has compiled a "best practices" approach to planning and organizing an art career. This new edition expands on effective goal-setting and shows readers the necessary steps to achieve their vision in today's art world. 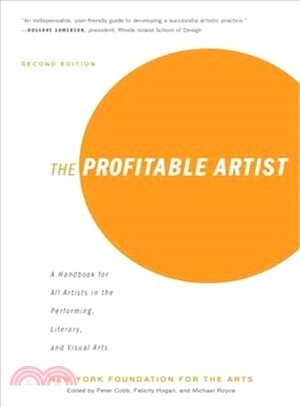 The Profitable Artist, Second Edition, also includes up-to-date information on legal concerns, social media marketing, cultural entrepreneurship, and fundraising (particularly crowd funding). NYFA has identified common problems, examined specialized areas of business, finance, marketing, and law, and has distilled these topics in such a way that readers can digest them and apply them to their own experience and practice. Included are interviews, anecdotes, and in-depth case studies. The skills and guidelines in The Profitable Artist, Second Edition, will also translate effectively to teaching and mentoring opportunities that artists may encounter as their career progresses. This invaluable guide appeals to all artists in all disciplines of the literary, media, performing, and visual arts, from recent art school graduates to established artists undertaking new arts businesses to artists seeking more from their careers at any stage of their career. New York Foundation for the Arts has been providing essential services to artists in all disciplines since 1971. With more than forty years of institutional experience in arts education, NYFA brings an authority and legitimacy unmatched by any single author. NYFA is based in Brooklyn, New York.